I'm back with another Make it Monday card using my brand new brayer. I'm also using my new Spring Moss ink. My opinion on the ink is that it is very nice to have a great ink match to the paper, but I don't think this ink is better or worse than many of the other brands of ink that I have. However, I only bought the cube, and it was well worth $2. One more thing for today: I discovered a fellow PTI forum member's blog when she posted a giveaway. She requested that we spread the word on our blogs, in order to have a greater chance to win. I didn't want to do that until I checked out more of her blog. Well, I am here to tell you that her creations are so fabulous that I practically wore out my 'Pin It' button looking at them all. 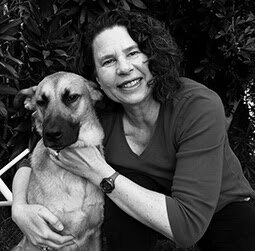 So, in good conscience, I can tell you that you should head on over to Neat & Tangled and check out Danielle's blog. You won't be sorry. Today, I am playing along with Cas-ual Friday's CFC #26 as well as the Play Date Cafe PDCC105. I wasn't sure about those colors at first, but the photo was just so yummy, I decided to try anyway. I interpreted the colors to be PTI Kraft, Blueberry Sky and Fine Linen. I also used Colorbox Cerulean Blue ink. 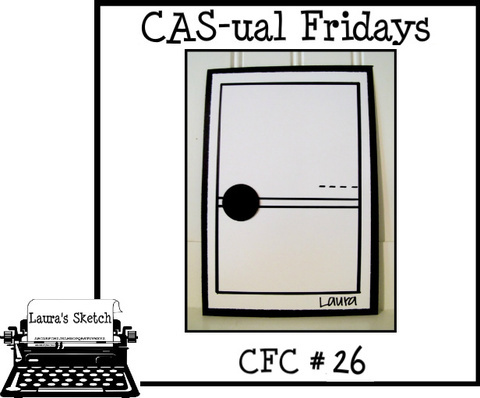 Since the CAS-Friday challenge sponsor is Lawn Fawn, I decided to use my only (so far) Lawn Fawn set, Clear to See. All the eyeglass images are embosssed with clear ep. 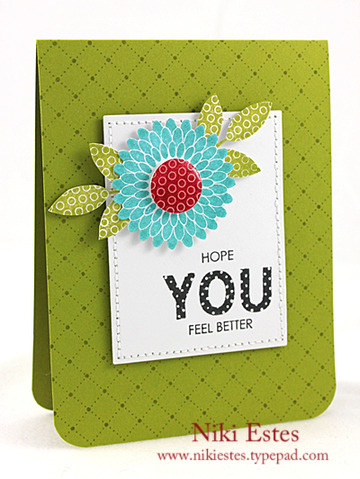 I used a Hero Arts Envelope background stamp on the card base, and PTI Background Basics Text on the blue oval. 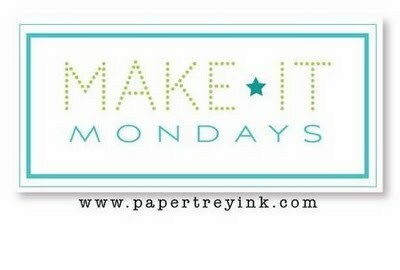 This week's Make It Monday technique shows us how to make a beautiful background using a brayer and an impression plate. Click here to see the video. I've never done anything like this, but was excited to try. I have several impression plates from PTI, and was able to buy a brayer at Michael's yesterday. I used the Mehndi Medallion impression plate and Brilliance Cosmic Copper ink. The ribbon is from my special stash of silk ribbon from Britex in San Francisco. I put the sentiment on a tiny tag die cut, and stamped it with one of the mini images from the Mehndi Medallion. The panel is popped up from the Smokey Shadow card base with dimensionals. It's impossible to see from this photo, but there is a real coppery sheen to the card from the Brilliance Ink. Here is a peek at the inside of the card. I stamped it with a very light inking of the Mehndi Medallion stamp, so I could still write over it. I had pinned a set of cards by Debbie at Lime Doodle quite a while ago, thinking I would make a set myself. 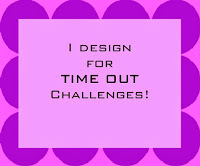 Actually, I am often pinning cards from Lime Doodle thinking I will case them, as her creations are some of my favorites. It took me a while to get to it, but here they are. 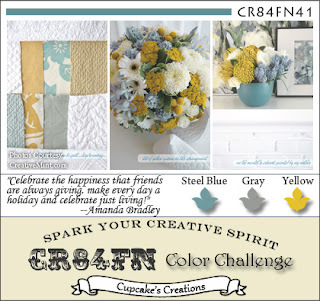 I used Harvest Gold, Ocean Tides and Smokey Shadow and played along with this week's CR84FN Color Challenge #41. 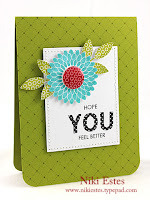 This is my second card for this month's Papertrey Blog Hop. You can see my first card here. I really liked my first card, but after I looked at the card and the inspiration photo together, I didn't think that the card was close enough to the photo. So, I looked at the photo again, and this time the photo said something different to me. First, it said "Are you sure you don't have pumpkin stamps? Go check." Then, it said "Paper piece those pumpkins." I don't know why I didn't see that the first go round, because it seems so obvious now. Today, I am playing along with Papertrey's October Blog Hop. 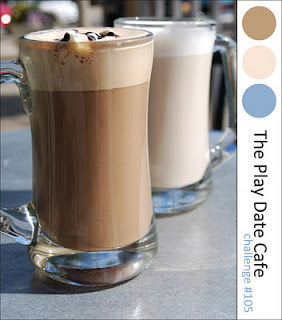 We were challenged to make a card based on this inspiration photo. I loved the picture, and thought about what I saw: pumpkins (which I didn't think I had), acorns--which I have, fall colors, green polka dots, and three main focal points. 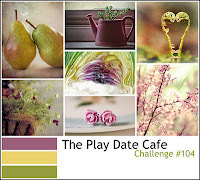 I made a card today to play along with the CASE Study Challenge #62 and the Play Date Cafe Challenge #104. We had this incredible card from Niki Estes to work with. After I finished the card, I realized that it fit the criteria for this week's CAS-Friday challenge #25 to 'just add color', since I used a Prismacolor pencil on the 'thanks', so I will post it there, as well. A quick post of a super simple card. 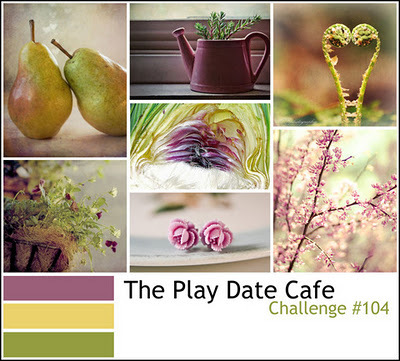 I am entering it into the Clean and Simple Challenge on a new website I just found. It's a bit hard to see in this picture, but both the front panel and the leaf are raised with dimensionals. 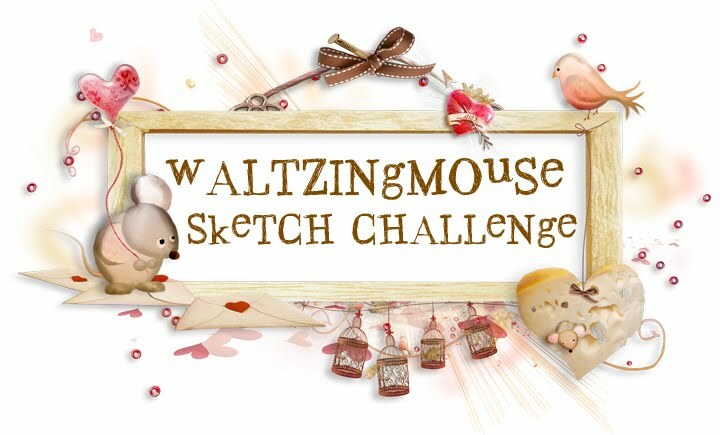 I hope that over time I do so many WM sketch challenges that I lose track of the number, but for now, I can tell you that this is my second challenge. I made a card for WMSC70 shown above. 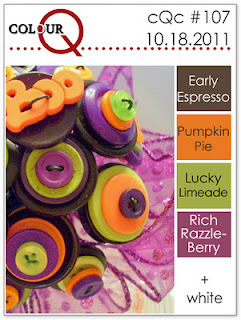 I am still using Hocus Pocus, borrowed from Cathy at Empty Nest Crafters. What a fun set. I think this set may need to come home with me for good one of these days. I've been having fun playing with my Autumn Acorns set. Here is another card. I guess I will be making lots of Thanksgiving Food Baskets. I was inspired by this card to make something simple with the leaf die cuts. I popped a few of the leaves up with dimensionals. 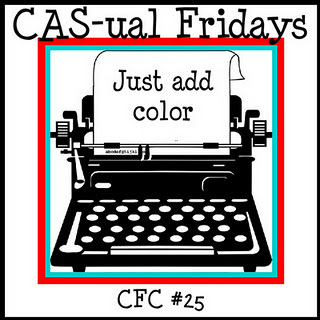 I have another card for this week's CAS-ual Friday's challenge to add color to your stamped image. Click here for my previous post, which shows the same card in red. I created a stamped background using one of the stamps, and then randomly colored in parts using purple Copic (V15). I have a card for this week's CAS-ual Friday's challenge to add color to your stamped image. Because this week's sponsor is Clear and Simple Stamps, I decided to use my favorite (and only) CSS set to CASE a card I had previously made and sent to a friend. I have been meaning to make more of this particular card, because it is a favorite of mine. Click here for my next post, which shows the same card in purple. 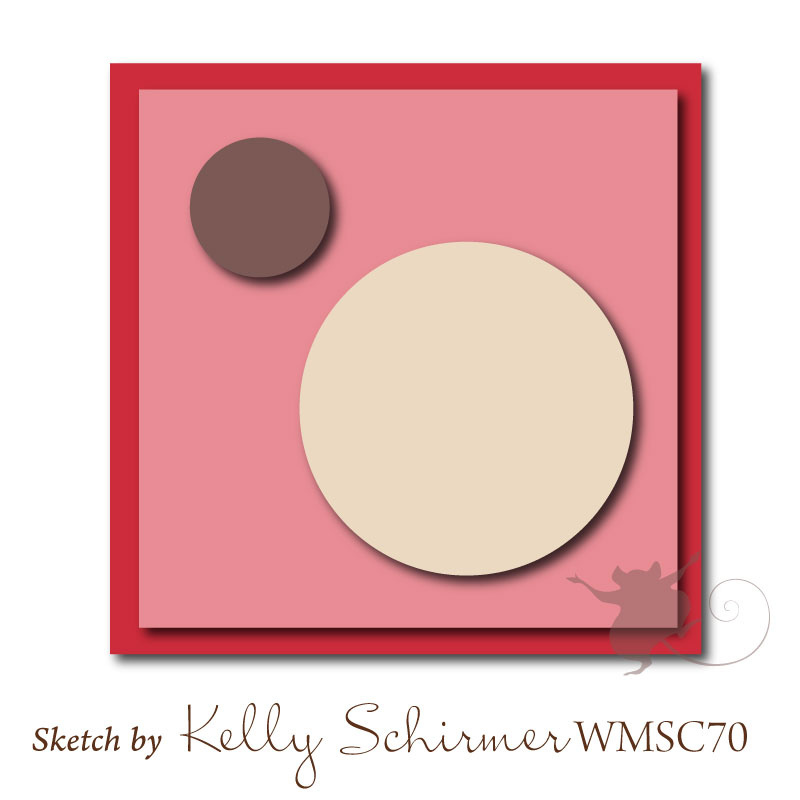 I created a stamped background using one of the stamps, and then randomly colored in parts using red Copic (R29). I love the fact that this stamp set has a matching set of dies. It made cutting that purse trio a breeze. I made a card just for fun--to play with my Autumn Acorns set, that hasn't gotten nearly enough love--and to have something personal to tuck into one of the Thanksgiving food baskets I will be creating for the needy elderly in my community. No challenges this time. I based this card on one of Maile Belle's cards she made for the release of this set. I used Mat Stack #5 as my main frame, and cut a window out of it with Fillable Frame #11. I used a color scheme of PTI Lavender Moon, Soft Stone and True Black. Nice and spooky, and no orange in sight. The bats are from a Martha Stewart punch I picked up at Michaels last year, and the sentiment is on a die cut made out of PTI's Christmas Label die. I am loving that die for all sorts of things, although one day, I really should use it with the coordinating stamp set I bought. It is time for our October Four-of-a-Kind post. This is the third in a series of monthly posts where Cathy, Kim, Renee and I challenge ourselves to make a card out of a kit sent to us by the hostess of the month. You can see the first challenge here and the second challenge here. 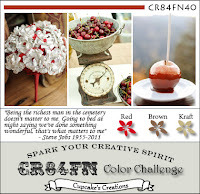 I am the hostess this month, and I chose to create a kit using Up, Up & Away. I didn't think any of the other gals had this set. I also sent some Polka Dot Parade paper in Ocean Tides, Summer Sunrise and Ripe Avocado. And, here is what it looked like all packaged up. I put all the little pieces in envelopes made out of maps of San Diego using the Seed Packet Die. Please stop by their blogs, if you haven't been there already, and see what they have created for our third Four-of-a-Kind post. I am participating in my first ever Waltzingmouse Blog Waltz. 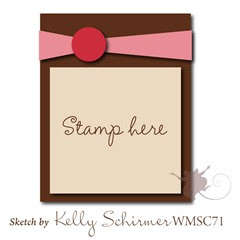 As I only have one WM stamp set (so far), my dear friend Cathy from Empty Nest Crafter sent me a big batch of stamped and cut images so I could have enough to make some cards and participate in all the fun. The theme this month is Gratitude/Thanksgiving. I'm back with another card for this week's CR84FN color challenge. This one is a birthday card. Can We Eat the Cake Now?